I don't charge anything or make any money off of this tool so I would appreciate your support by voting for @yabapmatt for Steem witness! To vote for me you can Click Here or go to https://steemit.com/~witnesses and find @yabapmatt in the list and click the upvote icon! 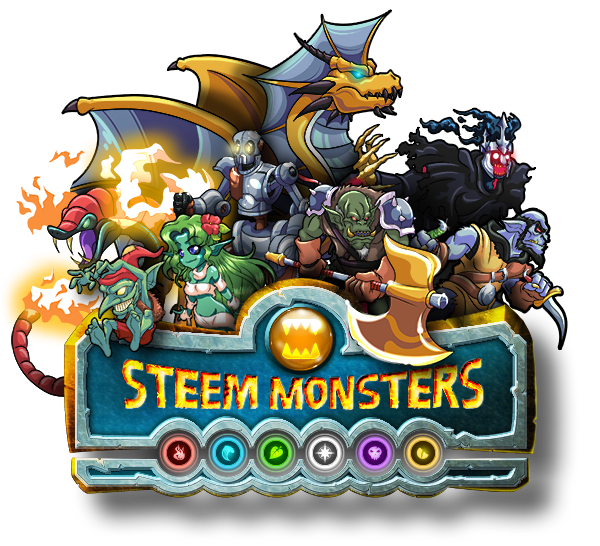 Check out Steem Monsters, a new collectible card game built on the Steem blockchain! Buy/sell/trade on the decentralized Market, and battle with thousands of other players in live PvP combat! Bid-based voting bots work on a bidding system. You can send any amount of SBD above the minimum (minimums vary for each bot) and once the bot account reaches 100% voting power it splits a 100% upvote between all of the bids based on each bid's % of the total amount bid during that period. It takes 2.4 hours for voting power to return to 100% after a 100% upvote so each bidding period typically lasts roughly 2.4 hours. Recently some bots have switched to giving out a 50% upvote every 1.2 hours instead. You can see this indicated next to the "Vote Value" in the table below. Take the following example: With a 2.4 hour bidding period user A sends $1 to a voting bot and user B sends $3. The total bid is $4 so that means that user A will get a 25% upvote on their post and user B will get a 75% upvote. If the bot's 100% upvote is worth more than $4 then both user A and B will receive an upvote worth more than they have spent. Please note that vote values are based on the current value of STEEM. As STEEM prices rise or fall the value of votes will too. Additionally 25% of the value of votes cast more than 30 minutes after a post has been made go to the curation rewards, so for a $0.75 payment you would need at least a $1.00 upvote to be profitable if you are taking curation rewards into account. Each voting bot has their own quirks and rules and those can change at any time. I do the best I can to keep this site up to date however it is your responsibility to check each voting bot before you use it. You can click on the links in the table below to go to the SteemIt profile page for each bot. Note! Actual vote value may differ substantially from what is shown here! This is an informational tool, use at your own risk. IMPORTANT UPDATE - PLEASE READ! All vote and total bid values are now shown in USD by default based on the current exchange rates for STEEM and SBDs. Profitability calculations now also take into account the exchange rates of the two currencies. If you want to view numbers in a different currency you can choose a currency in the settings section above. To view the numbers how they were originally, choose the "POST REWARDS" currency which matches what is shown on steemit.com. Interested in earning a return on your Steem Power investment? Go to isteemd.com to see up-to-date information and ratings of the voting bots that pay out their earnings to SP delegators! * iSTEEMd is a third-party service not created by @yabapmatt or otherwise affiliated with the Steem Bot Tracker website. There was an error loading bot info. Please try again in a little bit. Promote your post with @minnowbooster now! SP Delegation Market, Steem Voter, Sell Your Vote and earn SBD & Curation! @minnowbooster is always available and can be used at any time. Send at least the Min Payment amount specified to @minnowbooster with your post URL as the memo. You will receive an profitable upvote on your post based on the amount of your payment. See http://minnowbooster.net for more details! Promote your post with @booster now! Promote your post with @smartmarket now! Promote your post with @tipu now! Vote values shown on this site are ESTIMATES based on the available information at the current time. For bid-based voting bots, bids often come in right before the round ends which affect the payouts. Please make sure you understand how the bots work and that any payouts estimated here are not guaranteed! Send a bid to @! Copyright © 2017 Yabapmatt. All rights reserved.